HONG KONG, CHINA – Media RAJAWALISIBER – 7 November 2018 – A lavish holiday in Hong Kong doesn’t always have to burn a hole in your pocket. With Dorsett Wanchai’s 50% off all suites deal, travel like a king or queen and be pampered by world-class hospitality while paying only half price for one of the most exquisite suites in Hong Kong. This deal is only available on the official hotel websitefor book-and-stay periods between 20 November 2018 and 31 March 2019*. The Ocean Suite is decorated with marine elements, turning a living space into a marine park for a family to “live” in an undersea world. This 48 sq. m. suite features a semi-equipped pantry, a living area with a sofa bed, a dining area, and a separate bedroom fitted with a comfy king-size bed, as well as a spacious bathroom with bathtub and standing shower. The Sony 4K 3D Experience Suite, on the other hand, ensures family and leisure travellers’ entertainment needs are met with perfection with Sony’s latest gadgets. And for business travellers who long for a relaxed atmosphere after a full day’s work, theOsim Massage Suite is just the thing for those tired muscles. 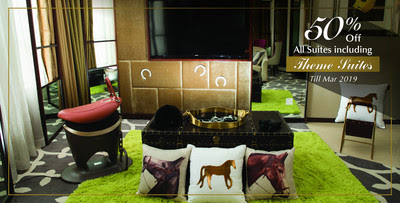 Then there is the Jockey Suite which is for those who enjoy the thrill of racing. The highlight of the Jockey Suite is the unobstructed racecourse view. If guests wish to visit the racetrack on racing nights (Wednesdays), they will be given a free “Happy Wednesday” Pack with free admission ticket, free drink, and a gift shop voucher.